(Nanowerk News) Physicists at the University of Kansas have fabricated an innovative substance from two different atomic sheets that interlock much like Lego toy bricks. The researchers said the new material -- made of a layer of graphene and a layer of tungsten disulfide -- could be used in solar cells and flexible electronics. Their findings are published today by Nature Communications ("Electron transfer and coupling in graphene-tungsten disulfide van der Waals heterostructures"). Hsin-Ying Chiu, assistant professor of physics and astronomy, and graduate student Matt Bellus fabricated the new material using "layer-by-layer assembly" as a versatile bottom-up nanofabrication technique. Then, Jiaqi He, a visiting student from China, and Nardeep Kumar, a graduate student who now has moved to Intel Corp., investigated how electrons move between the two layers through ultrafast laser spectroscopy in KU's Ultrafast Laser Lab, supervised by Hui Zhao, associate professor of physics and astronomy. "To build artificial materials with synergistic functionality has been a long journey of discovery," Chiu said. "A new class of materials, made of the layered materials, has attracted extensive attention ever since the rapid development of graphene technology. One of the most promising aspects of this research is the potential to devise next-generation materials via atomic layer-level control over its electronic structure." "A big challenge of this approach is that, most materials don't connect together because of their different atomic arrangements at the interface -- the arrangement of the atoms cannot follow the two different sets of rules at the same time," Chiu said. "This is like playing with Legos of different sizes made by different manufacturers. As a consequence, new materials can only be made from materials with very similar atomic arrangements, which often have similar properties, too. Even then, arrangement of atoms at the interface is irregular, which often results in poor qualities." Layered materials such as those developed by the KU researchers provide a solution for this problem. Unlike conventional materials formed by atoms that are strongly bound in all directions, the new material features two layers where each atomic sheet is composed of atoms bound strongly with their neighbors – but the two atomic sheets are themselves only weakly linked to each other by the so-called van der Waals force (thus the "van der Waals heterostructures"), the same attractive phenomenon between molecules that allows geckos to stick to walls and ceilings. "There exist about 100 different types of layered crystals -- graphite is a well-known example," Bellus said. "Because of the weak interlayer connection, one can choose any two types of atomic sheets and put one on top of the other without any problem. It's like playing Legos with a flat bottom. There is no restriction. This approach can potentially product a large number of new materials with combined novel properties and transform the material science." 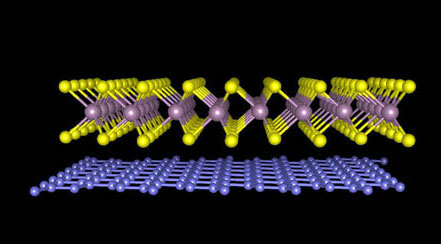 The team used tape to lift a single layer of tungsten disulfide atoms from a crystal and apply it to a silicon substrate. Next, they used the same procedure to remove a single layer of carbon atoms from a graphite crystal. With a microscope, they precisely laid the graphene on top of the tungsten disulfide layer. To remove any glue between the two atomic layers that are unintentionally introduced during the process, the material was heated at about 500 degrees Fahrenheit for a half-hour. This allowed the force between the two layers to squeeze out the glue, resulting in a sample of two atomically thin layers with a clean interface. Doctoral students He and Kumar tested the new material in KU's Ultrafast Laser Lab. The researchers used a laser pulse to excite the tungsten disulfide layer. "We found that nearly 100 percent of the electrons that absorbed the energy from the laser pulse move from tungsten disulfide to graphene within one picosecond, or one-millionth of one-millionth second," Zhao said. "This proves that the new material indeed combines the good properties of each component layer."